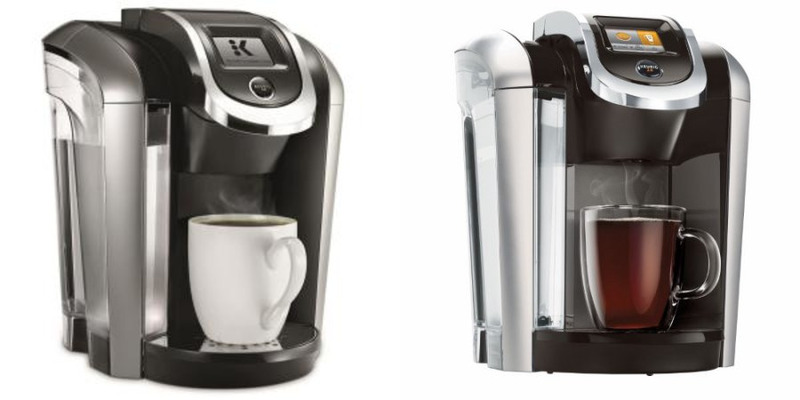 Keurig K425 vs K475 which mid-range brewer should you get ? Keurig sure do like to release a lot of models with similar specifications. If you have been looking at the K425 and the K475 then you might be wondering just how do they differ ? To save you some time the K475 comes with a water filter kit, the K425 does not.​ It's that simple ! The K425 is capable of brewing 10 different sizes ranging from 4 up to 30 ounces depending on the type of pod used. The K425 can accept the following Keurig pods: ​K-cup, K-mug, and K-carafe. If you are a fan of more traditional black coffee the way it is brewed in a diner then you can always use the K-Carafe to make a bigger, weaker coffee. The K-Carafe however is sold separately. ​The K425 has a 2.4 inch touch screen. From the touch screen you can control the the brewing strength, temperature control, high altitude setting, energy saver mode, clock, favorites and Carafe auto brew. If you are making coffee via the K-Carafe you can expect a time of around 3 minutes.​ For the pod style shorter coffees should be done in about 1 minute. The Keurig K475 is the exact same machine as the K425 above only it comes with a water filter starter kit. ​The kit includes two water filters which are placed inside the reservoir in a special implement. If you already filter your water before you use it in your coffee brewer or if you use bottled water then this may not be too much of a concern. What is the difference between the Keurig K425 and K475 ? As outlined above the only difference between both machines is the addition of a water filter kit that is included with the K475.